Rebecca bought me Hopcross Jilly, a Mercy Thompson graphic novel, by Patricia Briggs for my birthday, and it was awesome because I hadn’t even known it existed! It focuses primarily on Mercy’s stepdaughter Jesse, who is struggling to find her place in high school now that she is known as the daughter of the local werewolf alpha. I’m trying to be as spoiler-free as possible, so excuse the coyness, but the events also take place after the big showdown with the fae, so the main antagonist is fae. Which is where my problem comes in. From just about the beginning of the series, I’ve been on the fae’s side in their struggle with humans. In Briggs’ world, the fae have been treated somewhat similarly (though better) to how the US treated Native Americans, with extreme prejudice and isolation. So, when they have finally taken as much as they are going to take, it feels like an underdog fighting back, even though they are in fact murdering people. I found myself on the unsupportable side of a debate with Rebecca in which I was trying to hand-wave away the (fictional) murder of innocent children. Anyway, it was fun to see more of Jesse, who is usually very much a side character, and the fae villain was quite interesting, and it had a satisfying ending, even if it wasn’t as pro-fae as I would have liked. I do also want to qualify this by saying that Briggs is clearly a novelist, not a graphic novelist, so there are times when the action and dialogue gets a little muddled since she isn’t writing in quite the screenplay style that a graphic novel demands. I have also been reminded that I completely forgot to review Briggs’ Shifting Shadows, which is unforgiveable considering how long I’ve been whining for something exactly like this. Shifting Shadows collects all of Patricia Briggs’ short stories in a single volume, including the Alpha and Omega novella that kicks off that series, as well as some brand new stories. The new stories feature Mercy, of course, but also a variety of side characters that haven’t been given much backstory before, including Ben, one of Adam’s least pleasant pack members; Ariana, the fae with whom Mercy’s ex, Samuel, falls in love; and Kara, a young girl werewolf mentioned very briefly in the second Mercy novel. And, of course, it contains all of my favorites from a variety of anthologies, like “Seeing Eye,” in which a werewolf and a witch pair up to bring down an evil witch coven; “Fairy Gifts,” about a vampire summoned to save a trapped fairy; and “The Star of David,” a Christmas story about David Christiansen, a werewolf mercenary from the first Mercy Thompson novel. I am just so happy to have them all collected in one place! Periodically I like to drop by the websites of my favorite authors to see when their next books are coming out and if they have anything new and interesting up. Lois McMaster Bujold doesn’t tend to update her website very much, alas. But she does actively support fanfiction, which I appreciate. Patricia Briggs is pretty good with her website, although she’s gotten somewhat less active on it as her career has taken off. Ilona Andrews is still very active on social media, including their own website, AND posts regular free stuff. Robin McKinely has a decent website, although I’m generally somewhat disappointed in her. I love her early work (The Blue Sword, The Hero and the Crown, and Beauty) and feel like Sunshine was her absolute Best Book Ever! Ever since, it’s been just kind of down hill. But I still like to check up on her, periodically, to see if maybe there will be a sequel to Sunshine at some point, or if any of her more recent books look good. Anyway, this is all a long wind up to letting you guys know that Ilona Andrews has the first chapter of her next book up! 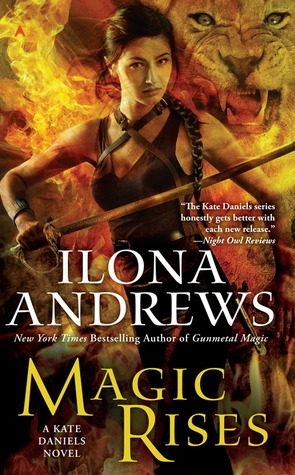 This is book 6 is the Kate Daniels series, Magic Rises, due out on July 30, 2013. Yay! You can read the excerpt: HERE!!! However… the chapter raises some concerns for me. Thus: Here Be Spoilers (for both Book 5 and for Book 6). There are a lot of girl-vampire-werewolf series out there, with a wide range regarding quality. Frost Burned is the most recent book in one of those series, that started out excellent, backslide into generic, but has managed to recover. This is the tenth* book set in this particular universe, the seventh that follows the character Mercy Thompson, and I was impressed. The first few books in this series (Moon Called, Blood Bound, and Iron Kissed) are the best ones, while some of the most recent ones (Bone Crossed and River Marked) have felt rather bland, like Briggs was forced to write them in order to fulfill a contract, without having any particular plan or goal with them. In Frost Burned, Briggs is back with energy and interest. I’m guessing it’s due to the major happening that concluded her most recent book set in this universe, but following a different set of characters. The Alpha and Omega series only has three books so far (Cry Wolf, Hunting Ground, and Fair Game) and these keep on getting better. The end of Fair Game was so spectacular, in fact, it drew me back into reading the Mercy Thompson series, just so that I could see what happens next in this universe. And, without giving any spoilers: there is definitely a lot of fall-out. I’m very excited about Briggs revamping (hee: re-VAMPing!) this universe, and think it was probably pretty important that she started alternating which series she was writing, so she could approach the characters with excitement rather than getting bored with them. However, I’m not entirely sure how readable any of her books are, at this point, without going back and reading the earlier ones. Frost Burned did a pretty good job of filling in the blanks for what happened before, but it was enough that I think I need to go back and read the earlier Mercy Thompson book that I skipped entirely (Silver Borne). Although, if you want to jump into this universe without having read any of the previous books, I would start out with Fair Game, just because it was a good book, delightful characters, the climax/epilog is really spectacular, and it sets up a whole new situation that is going to continue percolating through any future books in this universe. * Or eleventh, if you count a novella in an anthology. Or fourteen, if you count short stories in anthologies. A couple of weeks ago, I wrote about the first two Alpha & Omega books, and mentioned that the third one was out in hardcover. Fortunately for me, my new local library had it, so I was able to read it without paying a hardcover price. My expectations were moderate since Briggs has a tendency to lose steam with her ongoing series, but I was satisfied with Fair Game. It wasn’t as well-crafted as Cry Wolf, the first book, but I thought it stood on par with the second book, Hunting Ground, but in a different direction. Cry Wolf had a really good balance of fantasy and mystery, while Hunting Ground tipped more toward the fantasy, pushing the mystery into the background a little bit and focusing more on the dynamics of the werewolves and vampires. Fair Game goes in the opposite direction, being a pretty surprisingly straightforward murder mystery with the fantasy elements just adding a bit here and there. Now, I really like murder mysteries, so this was a-ok with me, and if given my preference would almost always chose for the mystery to come first and the fantasy second. I wish I’d thought to mention this in my previous post, but Briggs does this so well that while I really appreciate it, I don’t always notice it, if that makes sense. Her Alpha & Omega books are all written from multiple points of views, changing the narrating voice by chapter, or occasionally within different sections of chapters. It reads a lot more naturally than you’d think it would, with different characters stepping in when they have information that the reader needs. In the previous two books, the narrators have all been werewolves; in Fair Game, for the first time, one of the narrators is a human investigator, which is a refreshing outside perspective and emphasizes the mystery aspect of the story. Spoiler-y, but not really: the very end does something very, very interesting with the world Briggs is building in the these books, so I’m actually now super-excited for the next books in both this series and the Mercedes Thompson series, which both take place in the same world, since there are going to be some dramatic changes. Sorry about the recent lack of posts. At the beginning of the month, I moved halfway across the country from Boulder, Colorado to the Washington, D.C. area. I was all prepared with three prewritten posts to get me through the chaos of the actual move itself. What I hadn’t predicted is that I would get so overwhelmed with everything being new and different that I would immediately retreat into simply rereading my trashy comfort books, which is what I’ve been doing for the past few weeks at a furious pace. I’ve reread all five of Ilona Andrew’s Kate Daniels books, which Rebecca has already written about, and both of Patricia Briggs’ Alpha & Omega books, which I figured I’d introduce here, since it could be a little while since I read anything new. Briggs is better known for her Mercy Thompson series, featuring a female mechanic who shape-changes into a coyote, but was raised by a pack of werewolves. It is your typical werewolf/vampire genre series, but just done far better than most. Whenever I run into Charlaine Harris fans, I always make a point of recommending Patricia Briggs, since Mercy Thompson is everything Sookie Stackhouse isn’t: smart, independent, funny, etc. The first two books are immensely entertaining (I might read them next), and the third one is equally good but delves into some unexpectedly difficult-to-read territory (I am not going to read that next). After that, Briggs seemed to lose interest a little bit, and the subsequent books do not have the same quality of writing and plotting. However, Briggs then turned her attention to a new series, the Alpha & Omega series, currently with two books in paperback and one in hardcover, which I haven’t read yet because I’m very much against hardcover books. This new series is great! It features peripheral characters from the Mercy Thompson books who are a little darker and tortured, which I always appreciate, and is set smack in the middle of the werewolf pack, instead of on the fringe. The series actually kicks off with a short story/novella in the book On the Prowl, which is often shelved in the romance section and has a cover that will embarrass you to be seen carrying around. On Rebecca’s advice, I haven’t read any of the other stories in the book, but the Alpha & Omega story is actually good enough to be worth the full cost of the book, in my opinion. (Although, on a side note, the story is available on its own for the Kindle through amazon.com, which is one of the best arguments for a kindle that I’ve heard so far.) The story does set the entire series up to the point that the reader would be missing serious background information if they started with the first full novel. The first full novel is Cry Wolf, and just really delves into the characters and their relationships with each other, all within the confines of a very well structured and paced narrative. The second novel, Hunting Ground, doesn’t have quite the same tight plot structure, but is still very entertaining. 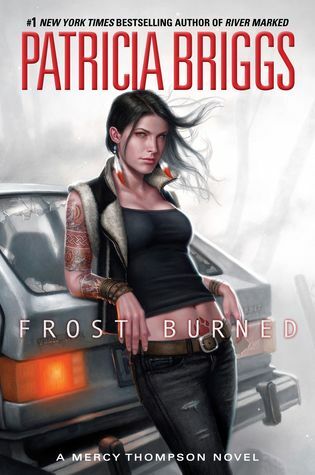 I’m somewhat afraid I’m seeing a bit of a pattern with Patricia Briggs, so I’m mentally preparing myself for the third book being a potential disappointment, but I’m still very much looking forward to reading it. Right at this moment, I’m more into comforting fluff books than quality, so I’m sure it will live up to that. I really like collections of short stories – I think they are a great way to get introduced to new authors and to see a lot of different authors’ perspectives on a shared topic. However, I’ve started to get irritated with these collections recently published that all feature a subset of the same best-selling authors the fantasy genre. It seems like such a blatant money-grab. I love Patricia Briggs but do not care for Charlaine Harris, so instead of just publishing a book of Briggs’ stories, there is always one of hers in a collection that also includes Harris and other authors I have no interest in. And, I’m sure fans of the other authors feel that way about Briggs. So, this seems like a very calculated ploy on the part of the publisher to try to make us all buy books in which we are only interested in about a quarter or even less of the content (especially disappointing if that quarter turns out to be not all that great, either). I fell for it and bought two such collections, but wizened up this time and went to the library, and am very glad I did. I originally intended to gather all of Patricia Brigg’s short stories that I hadn’t already read, but an Ilona Andrews story slipped in, too. 1) Naked City, with the tagline “Tales of Urban Fantasy,” has a nice theme of each story being set in a recognizable city that the author gives some attention to describing. Of the five stories I read (out of the 20 in the book), four of them featured plots that were very specifically tied to a feature of the city, which was very interesting. Oddly, though, the fifth, Melissa Marr’s “Guns for the Dead,” was actually my favorite, taking place in an Old West type environment that is kept somewhat generic purposefully for the plot reveal. Patricia Briggs’ “Fairy Gifts,” was my second favorite, of course, with new characters for her and set in Butte, Montana, which is just so interesting to read about given the complete lack of romanticism around that city. Briggs clearly loves the area, though, and writing about immortal beings such as vampires and fairies allows her to delve into the history of the place. 2) Home Improvement: Undead Edition, with the tagline “All-new Tales of Haunted Home Repair and Surreal Estates,” also features Patricia Briggs and Melissa Marr, and theirs were the only stories I read out of the twelve. This theme didn’t work as well – perhaps it was too specific? Again, Marr’s story edged out Briggs’. Marr’s “The Strength Inside” features a protagonist of a supernatural kind that I didn’t recognize from any of the normal Western mythologies. I’m not sure whether she was dipping into a more esoteric mythos or whether she invented it herself, but it was interesting either way. And, it is about battling Home Owners’ Associations, which is always entertaining, even if a little clichéd. Brigg’s “Gray” features a vampire, though not one of her regular characters, buying and renovating an old condo. It has some very sympathetic characters, but isn’t anything original. 3) Angels of Darkness features Ilona Andrews, and was the most worrisome to me when checking it out. The cover looks more like paranormal romance than fantasy, and I knew that Andrews’ books walk that line more than my other favorite authors. And, I was absolutely right to be worried, though it was even worse than I feared. You know how people criticize the story “The Beauty and the Beast” for basically being a romaticization of Stockholm Syndrome? Imagine Ilona Andrews tried to take that idea, make it super overt, but still try to keep it romantic. It is even more appalling than you are imagining right now. At 124 pages, her “Alpha: Origins” story is more of a novella than a short story, and is set in a different universe than either her Kate Daniels series or her Edge series. It took me almost a week to finish it because I kept having to put it down because it made me feel kind of dirty, reading about this level of subjugation in a clearly romantic plot. It reminded me of a call for submissions of fantasy romance books by a publisher that Rebecca told me about. They specified that the story had to feature an older or in some other way societally superior hero and the heroine had to be somehow in his power. It made me gag a little bit. 4) Down These Strange Streets was my favorite collection, leaning toward the noir side of urban fantasy and mystery. There were some really terrific stories, and some not-so-terrific stories, but the great thing about a collection of short stories is that after a couple of uninspired pages, I can just move on to the next story. It did bring home the point that a good noir mystery is harder to write than people think; the author has to somehow steep the entire story in a casual grimness. A surface gloss of darkness doesn’t cut it, and is quickly recognizable when reading a series of stories by different authors all in a row. Once again, though, Briggs’ story took second place, this time to a really engrossing story by Laurie R. King, who I had previously known only as a mystery writer. Her fantasy mystery, “Hellbender,” was subtle, realistic, and unfolded with perfect plotting, and I would love to read a full book of the same characters and universe. Briggs’ story, “In Red, with Pearls,” was my favorite of hers that I read in this glut, and featured one of her regular but peripheral werewolf characters, Warren, and his boyfriend Kyle. The short story structure didn’t give her as much time to explore characters and relationships as I would have liked, but was still a very entertaining mystery. Kinsey’s very acute analysis of her preference in memoirs made me revisit my short story collection preferences, and I think it is very similar. The more collections I read, the more I respect the editors. It seems like they need to tread a very fine line, where collections should have a common theme that tie all the stories together, but not such a narrow theme that the stories seem repetitive. “Urban fantasy” is too generic; “house renovations” is much too narrow.